Are you a Beatles-lover? Or are you just a nice ringtones-lover? Apple Corps has some great surprise for you. Beginning yesterday, fans around the world can use the band’s chart-toppers as ringtone and alert form for iPhone, iPad and iPod touch! You can also assign your favorite tracks to your favorite people. The Beatles and Apple have long, interesting history, dating back to disputes over the Apple name that the band has long used for their business ventures. After Apple moved into the music business, the two sides came into conflict over the trademark, finally leading to a 2007 agreement that saw Apple obtain all rights to the trademark and license it back to The Beatles for their specific users. 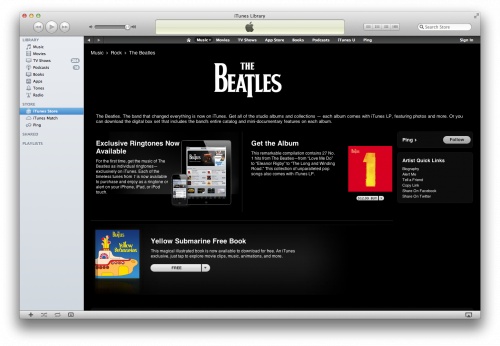 Continuing their close relationship with the iTunes Store, Apple and The Beatles will enjoy another found success. Before, the initial music (released in late 2010) was met with downloads of 5 million Beatles songs! Besides, 1 million albums have been downloaded by users by January 2011. The fact proves exactly that despite the legal wrangling between the pair, The Beatles music is still as popular as ever. See also: The Beatles Fans Are the Fans of Apple Too!